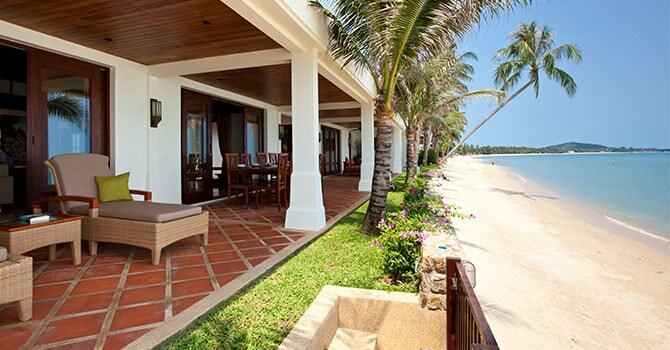 Villa Hibiscus is a truly special oasis tucked away on a serene white sand beach with glimmering turquoise waters. It’s four gorgeous bedrooms and open common areas are centered around a sparkling pool amongst a lush, gated garden. With a modern, state-of-the-art kitchen and chic, contemporary lounge area, this place is truly the ultimate getaway. This is your home away from home - perfect for you to celebrate, rest, unwind and just enjoy the beauty and splendor of Koh Samui. Special highlights include a Thai sala, or gazebo, chic granite and teak flooring, a modern built-in bar counter and sophisticated media systems for your entertainment and ambiance. This wondrous retreat is a true gem of perfection in the tropical paradise of the islands. 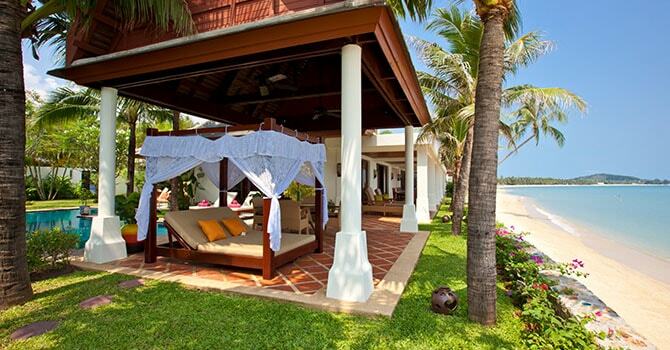 The villa boasts an enviable location in picturesque Maenam Beach, just metres from the soft white sand. 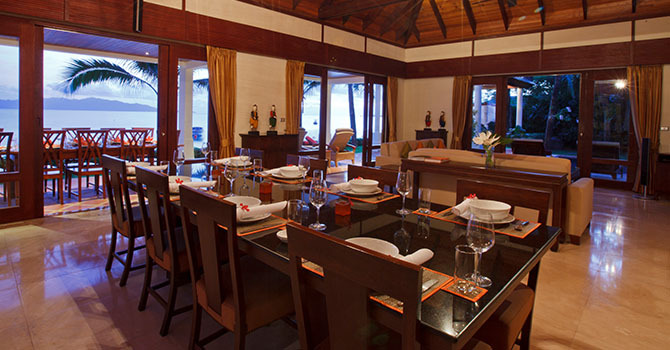 Many excellent restaurants are nearby, while other attractions such as the Fisherman’s Village are a short drive away. 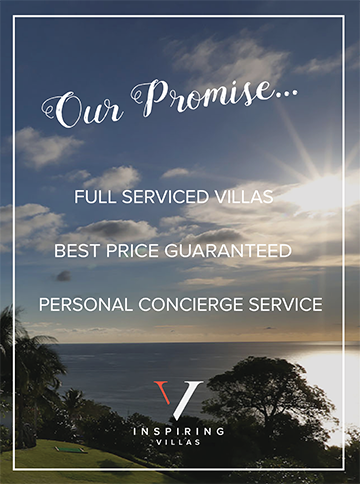 With up to four bedrooms, the villa offers flexibility for families and groups. 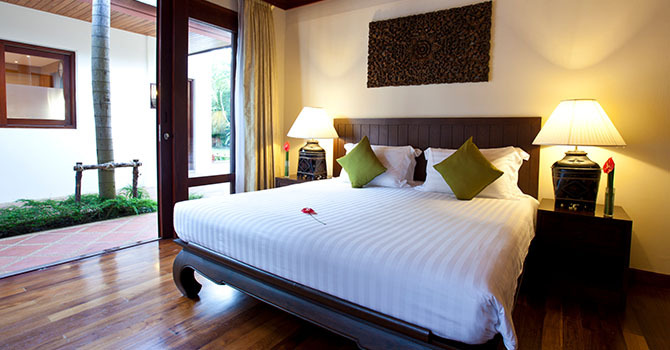 Each of the bedrooms are tastefully decorated, with rich hardwood floors and luxurious linens. The master bedroom has a king-size bed and ensuite complete with a relaxing bathtub, while the second bedroom also enjoys a deluxe king-size bed and ensuite. Two further bedrooms are configured as twins, with their own private ensuite bathrooms. Another day in paradise at Villa Hibiscus I have stayed in numerous beach villas around the South Pacific and S.E. 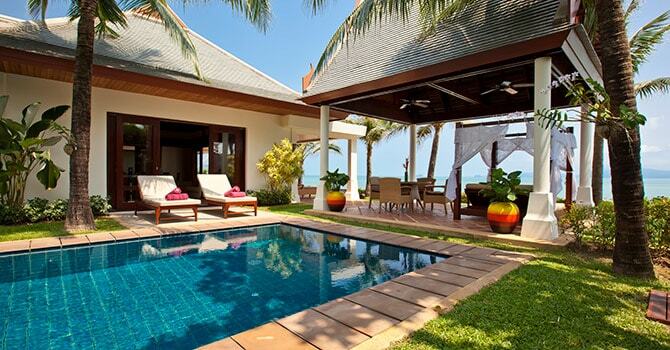 Asia but my recent stay at Miskawaan Luxury Beachfront Villas would have to top the list. As soon as we arrived I felt as if I was in a very comfortable homely private space of luxury and service. The layout of the villa enabled enough privacy without being too secluded. The rooms are large and finished with dark wooden flooring and icy cold air conditioning. Each villa had a well planned and spacious bathroom that was very well lit, with marble finish. The wife or girlfriend will be very happy. The queen size bed was extremely comfortable and the internet was fast. Our swimming pool was set under two beautiful Frangipani trees which made for a fantastic sight whilst swimming in the afternoon. The location which takes full advantage of the setting sun is one of the many qualities that these villas have going for it. There is a spacious alfresco bar dinning area that is close to the beach so you can enjoy those cocktails as the sun goes down....amazing. There are too numerous small finishes to mention however when you see them you will appreciate the time and effort that has been put in to make this place what it is. The service by all all the staff was very professional with tips and suggestions as to how to make our day trip arrangements flow as smoothly as possible. The food was was exceptionally fresh quality and sourced daily and prepared on site.  The staff made us feel exceptionally welcome with nothing being too much trouble. I cannot fault this place...i really hope you have as great as an experience as I had.